A software update will let iPhone owners switch off the "battery saver" feature that slows down some models, Apple has confirmed. The option to switch off the feature will appear on the iPhone 6, 6 Plus, SE, 6S, 6S Plus, 7 and 7 Plus models. Last month, Apple apologised after it was found to be deliberately slowing down some of its devices. Customers were angry that Apple had not been upfront about its actions before the practice was discovered. Many had long suspected the company slowed older iPhones to encourage customers to upgrade. 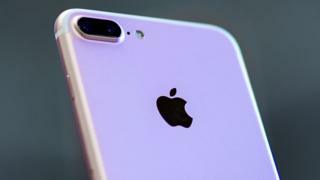 Apple admitted slowing some phones with ageing batteries but said it was done to "prolong the life" of the devices. The ability to switch off the battery saver will appear in iOS 11.3 when it is released later in 2018. The company said the feature "dynamically manages maximum performance to prevent unexpected shutdowns" but customers will be able to "turn it off". Replacing an affected iPhone's battery also restores its performance. After the practice of slowing older iPhones was discovered, Apple said it would reduce the price of an out-of-warranty battery replacement from $79 to $29 in the US for anyone with an iPhone 6 or later. In the UK the price dropped from £79 to £25. "With so many older iPhones in the market the battery performance issues have become a concern for a lot of consumers," commented Ben Wood from the tech consultancy CCS Insight. "Apple has also been under regulatory scrutiny so it is likely trying to offer as many options to consumers as possible so they can decide the best way to maximise the battery life on iPhones that are eligible for the new battery programme."